If It Looks Like Melanoma, How Likely IS It Melanoma…? If something on your skin looks like melanoma, does this usually mean that it IS melanoma, or just HOW do the odds swing in cases like this? You’re scared that the weird spot on your skin is melanoma because it just looks so strange. What are the odds that any ugly or weird skin lesion turns out to be a melanoma? What’s even more frightening is when the person who thinks that something looks like melanoma is your own dermatologist! 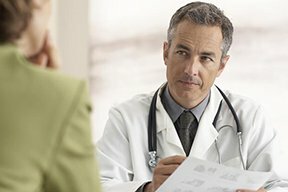 “Since so many benign lesions can mimic melanoma, if there is any suspicion for melanoma, a biopsy should be done right away,” says Dr. Tess Mauricio, MD, FAAD, a leading board certified dermatologist from Stanford University Medical School and CEO of MBeautyClinic.com. There is no quantitative data on what percentage of “this mole looks suspicious” or “I don’t like the way this looks” ends up being melanoma. But certainly, not every “this looks like melanoma” turns out to be the cancer. Waiting for biopsy results is agonizing, but the mole turned out to be benign. 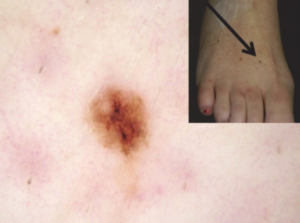 Not all “suspicious” or “different” moles test positive for melanoma, such as the one below. But if a doctor thinks that a lesion is worrisome, have it biopsied. Do not go the watchful waiting route to see if it changes in appearance over the next few months. Usually, this cancer stands out. Even in an early stage, it often looks peculiar. But sometimes, though, the tumor can look like a regular mole. In such a case, what makes it suspicious is that it’s new, or, it’s gotten bigger. Or maybe one day it bleeds for no reason or begins itching. But all the while, it looks innocent in that it’s symmetrical, one color and has smooth borders. An atypical mole and a seborrheic keratosis are two examples of benign lesions that can look like a melanoma. Dr. Mauricio is an internationally recognized cosmetic surgeon and the youngest woman to hold the position of President of The San Diego Society for Dermatologic Surgery. Percentage of Mole Biopsies that Come Back Melanoma? Can a Melanoma Mole Spontaneously Disappear or Regress? Precancerous Mole Removed and Growing Back: What this Means? Can Self Mole Removal Cause Melanoma?